I’m sure you’ve seen the stories about artisinal toast in San Francisco and lately news has been talking about the toast trend hitting Seattle, but I remember fancy toast being here years ago. There was a cafe called Nervous Nellie’s (now closed) that offered coffee and interesting toast. There was cheese, and jam, and jam and cheese, and cheese and a red pepper relish. I tried the relish because I’d never heard of it and, quite shockingly honestly, I really liked it. A whole lot. It was savory and tangy and a nice change from the usual sweet breakfast offerings. Nervous Nellies is closed now but I tracked down the ingredients to make the same style of toast. 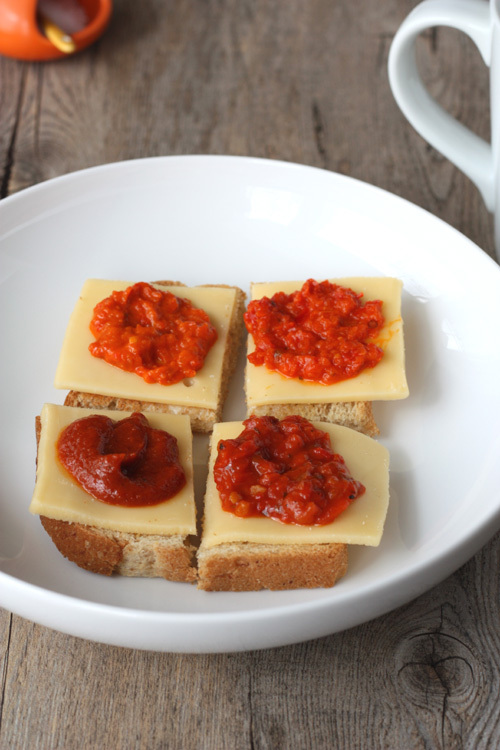 A bit of snooping around archived web pages and my old notes leave me believing that the ingredients I remember are Lappi cheese (a very mild cheese, havariti will work just as well), and Ajvar, a red pepper spread. 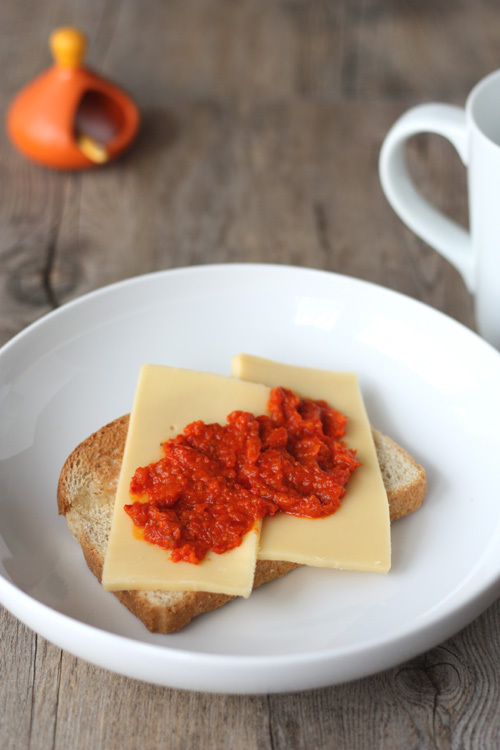 Add butter and a sprinkling of good salt to the toast, then slices of cheese and spread the Ajvar on top. The toppings are cold and creamy and a little spicy and tangy. I don’t think everybody will like Ajvar but I highly recommend giving it a try should you come across it. Nervous Nellie’s listed their red pepper relish as “Lutenica” on the menu but after doing a tasting of a few relishes I’m convinced that they were using something closer to Ajvar. At an imports store I found both hot and mild Ajvar as well as Pepptizer and Lutenica. They all looked similar with the exception of a few different ingredients. Clearly there had to be a taste test. 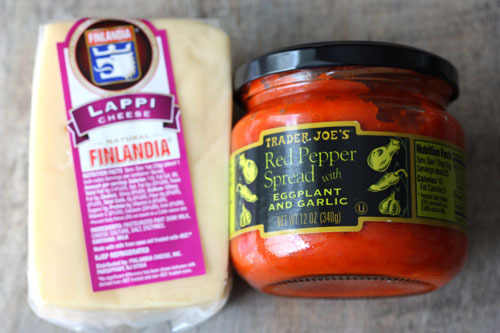 If you’re in Seattle and interested in sources: I tracked down Ajvar at Big John’s Pacific Foods Imports in SODO and the Lappi cheese at Scandinavian Specialties in Ballard. This winter Trader Joe’s had a red pepper relish that I suspect is the Zergut brand with a TJs label and last time I was in the store they still had a number of jars available. (I had the opportunity to ask a TJs employee and he said it was almost certainly one of those seasonal items that they won’t be stocking again after the run is sold out.) Update: mims mentioned in the comments below that the red pepper spread carried by Trader Joe’s is actually a year round product, and sure enough it’s been there on the shelves every time I’ve checked for it. It’s stocked down near the floor and easy to overlook, look for it and give it a try! If you have a Russian specialty foods store anywhere in your area you might see what varieties they have. That’s where I first ran across ajvar. Yummy! That trader joes product has been in my store for years, all year long. 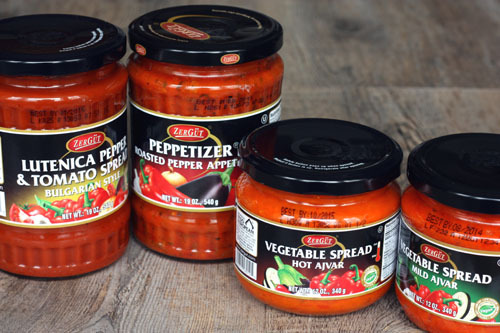 I think the red pepper (with no eggplant) spread is even better…and that is there on the shelf all the time whereI live ( I put in omelets so always have it on hand) yum. will try with the cheese! Toast is always better with anything BUT jam/jelly on it! You should also check out Bedlam Coffee in Belltown … that was the first place I ever had “fancy toast” (actually not that fancy; it’s pretty cheap but filling and good! ), plus they have a great back space to hold meetings in (helpful if you don’t have your own office space/conference room). mims – Really? This is great to know! TJs put the red pepper spread on an endcap last winter so I, and the employee I talked to, figured it was a seasonal item. And I’m glad to know there is a different version as well, I’ll go looking for it next time I’m there. Trisha and Alison – Thanks for the links to stories and recipes! M – You are never alone! At least when there is toast involved. I never liked sweet topping for toast, and even still have some opinions about peanut butter and jelly sandwiches. Erica – Thanks! I have been meaning to get out to the toast place that’s in the old Empire Coffee space but didn’t know about Bedlam Coffee. And thanks for the tip about the back room! Totally off topic but I was just on the Nordicware site and they have a new piñata pan and I thought of you. There used to be a little cafe called “Toast” in an old house on 16th and Madison that got torn down and had a Trader Joe’s built on that site. They had toasters on tables and lots of toppings to choose from. Overpriced for what it was but a fun idea! Dinette on Capitol Hill also had a fancy toast menu. Sounds like Seattle was on the forefront of the glamourtoast trend! Anne – I wish I’d been there! I lived in Ballard well before the TJs development went in. maggie – Thanks for letting me know, I didn’t realize Dinette did breakfast-y things. hummus is a good toast spread which combines well with cheeses, roasted veggies or sliced tomatoes. It was actually dinner toast – appetizers. I guess more of a riff on bruchetta, but they called it toast. Unfortunately Dinette is now closed but I’m hoping they find a new spot on the hill. I’m commenting very late on this topic, don’t know if you’ll see it. According to my Bulgarian husband, ajvar and lutenica are pretty much the same thing – they’re just the Turkish and Slavic names respectively for the same broad family of crushed pepper relishes. His measure for how good it’s going to be is to look for tomato paste in the ingredients – if it’s a prominent ingredient, then what you’re getting is *not* good ajvar. If you’re being truly Bulgarian, then the best cheese to pair it with is kashkaval, which is a semi-hard, yellow, sheep-milk cheese. Locally (in Toronto), we can often find it at Greek grocery stores. Thanks for this! I used to work at Nervous Nellie’s and they wouldn’t tell me what kind of cheese they used out of fear of being copied. I suppose now they have been closed long enough that it matters less. A craving this morning and a quick google search led me to this posting. Yum. Alex – Thanks for the notes! Maridee – I am so amused to find out that they wouldn’t tell you what type of cheese they use! Lappi is a guess on my part based on what I remember. I have an old note to myself that the menu (?) listed a cheese from Finland and I found either an old Yelp review or Flicker picture from somebody else that said the same thing. The people at Scandinavian Specialties listened to my description and suggested Lappi.